Comedian, actor, podcaster and TV host Joe Rogan landed his color commentary role at the UFC despite never having competed in a mixed martial arts bout, but make no mistake, he’s a highly skilled martial artist – and we’ve got the video footage to prove it! 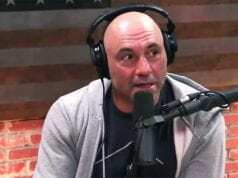 Rogan admits to having been obsessed with martial arts in his youth, becoming a taekwondo black belt by the age of 15 and going on to win four championships in Massachusetts along with a US Open tournament. He stopped competing in his early 20s after also dabbling in judo and kickboxing, but he’s never stopped training, and in addition to refining his striking skills he’s since become a black belt in Brazilian Jiu-jitsu under Jean Jacques Machado and a black belt in 10th Planet Jiu-jitsu (no-gi) under Eddie Bravo. Nevertheless, based on the video footage you’re about to see, it’s a crying shame that we’ll never get a chance to see him in action as there’s no doubting he has some serious skills. If it wasn’t for Rogan’s long-time friend Eddie Bravo it’s possible the world would never have known just how devastating his kicks are. Bravo knew only too well and was eager to spread the word, so he encouraged Rogan to demonstrate some of his taekwondo techniques which would be featured on his 10th Planet Jiu-Jitsu ‘Mastering The System’ YouTube video series. A bumper collection of clips from those segments, filmed at Rogan’s own custom-made home gym are featured in this video. They show Rogan’s excellent technique and in particular the jaw-dropping power that he’s able to generate as he practically folds his muay thai bag in half with turning and spinning side kicks, not to mention wheel kicks, spinning heel kicks, and more. 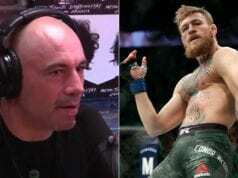 Thanks to Bravo’s videos word quickly spread that Rogan’s kicks were extremely potent and that led to a number of famous mixed martial arts fighters seeking advice from the UFC color commentator. Perhaps Rogan’s greatest honor came when UFC superstar Georges St. Pierre personally asked him to help with his own turning side kick technique despite being a Kyokushin Karate black belt in his own right. ”The best side kick I have seen in my life,” GSP said in admiration as he filmed Rogan killing the bag. Here’s Rogan giving his friend and fellow comedian / actor / podcaster Bryan Callen an impromptu kicking lesson during a recent edition of the ‘Joe Rogan Fight Companion’ show. Callen claimed to have taken taekwondo lessons in his youth, but it quickly becomes clear he could use a few pointers!